This vegan treat is my favorite post workout snack (and let’s face it, is better for me than hot dog chips). I love that I can take it on the go, so even if I’m in a rush I’m not missing breakfast. What’s your favorite post workout snack? The bowls from this recipe can be purchased here. This vegan treat is my favorite post workout snack (and let's face it, is better for me than hot dog chips). I love that I can take it on the go, so even if I'm in a rush I'm not missing breakfast. What's your favorite post workout snack. This is a vegan recipe that tastes amazing! This was delicious! I never thought of adding oats to a smoothie…now I’m hooked! I do not like oatmeal but love the taste of raw oats so this is perfect for me. I used almond milk instead of soy. This is so healthy and filling. Thanks for a great recipe! It’s one of my favorites too. I’m so happy you enjoyed it! This has approximately 235 calories. Thank you so much im going to try it this morning. I have had four kids and my latest one is 5 months old. My weight is up to 220 and im usually 180 feeling very discourgad about losing this baby weight bite of food i have. My problem is feeling full and eating yummy food and not feeling depraved. Im doing this low carb diet and have a calorie counter on my phone and i log in every day.can you help im could use any tips or recipes.,thank you! Ps im not a vegan. Could you make this with skim milk? Im not a fan of soy milk. What a great recipe, Thanks for posting! We’ve shared it to our FB group (Chasseur AUNZ) with links back. Do the recipes that have avocado have substitutes? I’m allergic to avocado.I know it’s a great diet food. Also, would the recipe taste just as good without it? Allergic to Strawberry and Avocado and coconut.What, if any, are substitutes available or would they taste just as good without them? 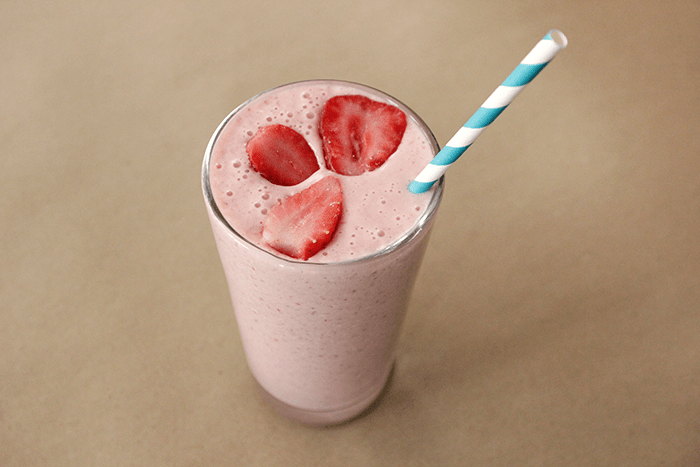 You could substitute raspberries for strawberries and soy milk for coconut. For the recipe’s that include avocado I would just try taking it out, unfortunately there isn’t really a good substitute for the avocado flavor. I hope that helps! Cat,what can I substitute for the sugar ? Could I use Almond milk instead of soy milk ? Instead of soy milk could I use Almond milk? Where did you find your bowls!? I can’t believe no one has asked that yet! what can be used in place of the rolled oats?